Italy international forward Andrea Belotti says that he will only leave Torino to join a club where he will be a regular starter. The 24-year-old sprang to prominence by scoring 26 times in Serie A last season and, although he has found goals much harder to come by this season, he reportedly remains of interest to a number of top European clubs. I'm not interested in moving to a big club if I don't play or get stuck on the bench. 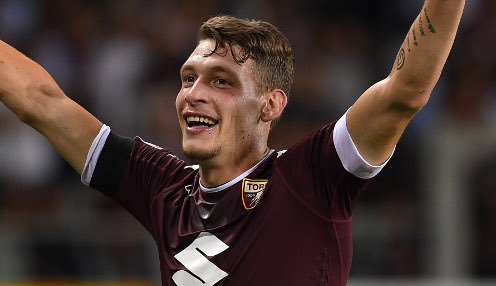 However, with a contract with Torino which runs until the summer of 2021 and which contains a buyout clause of 100million euros, Belotti is wary of where he decides to go, should he opt to move on. He told Rai Sport: "They tell me I should go and play in a big club which plays in the big cup competitions, but I will decide what is best for me. "I'm not interested in moving to a big club if I don't play or get stuck on the bench. If I move, it's to be a regular in the first team." Torino are currently in tenth place in Serie A, having lost their last four games after being unbeaten in their previous seven league outings. They return to action on Saturday 31st March when they head to Sardinia to take on Cagliari. Il Toro are unbeaten in their last six meetings with Cagliari and won 2-1 when the two sides met at the Stadio Olimpico Grande Torino earlier this season, with Iago Falque and Joel Obi their goalscorers. Torino are 2/1 to win the game on Saturday, with the draw available at 9/4, while a 1-1 final scoreline is priced at 5/1.